The last several weeks have been wild! It’s all good! And I am thankful to be able to announce a brand new collection of Daniel Fast recipes. They are all new in the Daniel Fast Cookbook – Version II. This cookbook is a great stand-alone, but also serves as an excellent companion to the Daniel Fast Cookbook – Version I or even Daniel’s Fast Cookbook. 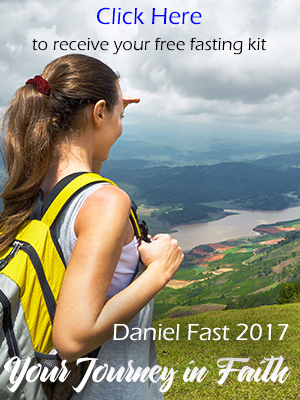 The Daniel Fast Cookbook – Version II is more than 100 pages and more recipes than you will need for the fast. It’s already sold 100s of copies to my great Daniel Fast friends who purchased eBooks from me before. You can click on “Store” and purchase this new Daniel Fast Cookbook or The Daniel Fast for the Body, Soul and Spirit. Thanks in advance for supporting this lay ministry by purchasing the eBooks. My whole goal with this blog, the Daniel Fast website and the Daniel Fast Cookbooks is to support you and others as you enter into this powerful time of spiritual fasting! Go to http://www.Daniel-Fast.com and click on the recipe link. You will find several recipes there to get you started. Hello there, today is my 3rd day of the daniel fasting, so far so good. I can not afford the book for recipes and ideas. Is there another way of getting your recipes and ideas? Hope your visit to South Africa and Zimbabwe will be blessed, our countries are beautiful. We are busy helping getting aid together (medical bags, jerseys, etc.) which will be going to Zim. I pray that God will annoint your work, please let our brother and sister in Christ know that they are in our prayers. You can find lots of recipes at http://www.Daniel-Fast.com/recipes.html and if you need more you can purchase one or both of the Daniel Fast Cookbooks. They both have enough recipes for a complete 21-Day Daniel Fast. Be blessed on your fast! I will have the pleasure of visiting your country in April on my way to Zimbabwe for a leadership conference! WE ARE STARTING THE DANIEL FAST IN A FEW DAYS TIME AND WOULD BE GRATEFUL IF YOU COULD PLEASE SUPPLY A FEW RECIPES. Just mix equal parts of canned black beans (rinsed) and the super sweet frozen corn (can get at WalMart or Trader Joe’s). Pour a little red or green salsa on it (the only kind I found w/o preservatives is at Trader Joe’s – otherwise just add chopped tomatoes & onion). Eat at any temp. I’ve also added chopped avocado! I love your site. It has helped me with my fasts. I was however, trying to find your blog from 2008 as there were many questions and answers there that have already been asked and answered by you that I wanted to review. I was looking for the answer to a question in regards to olives. I do read the labels but am confused about (not sure) about Ferrous Gluconate which is used to stabilize color (black olives). Also what about green olives and other items that have guar gum, lactic acid and sodium alginate. I’m not sure what these ingredients are. Thank you again for your time, energy and this wonderful site. God has truely blessed you with a wonderful ministry that touches so many lives. Yes, most soy products are fine, but you need to read the ingredient list to find out everything in the product. For example, most soy milk has cane juice added, which is sugar before it is dried and granulated. So using sweetened soy milk is not okay. Instead, you can purchase “unsweetened soy milk” which is 100% soy beans. Is it ok to eat soya products during the Danile Fast? You will find many recipes in that section. I found your order and I’ll send another copy to you! Thanks for all your support. Only because you and others purchase my eBooks am I able to give my time to this ministry. My whole goal is to serve God by serving His people and I am so grateful. No animal products are allowed on the Daniel Fast (including fish, poultry, beef, etc). Only vegetables, fruits, whole grains and a few other foods are allowed. i am planning to start on this Daniel Fast. I have heard so many positive spiritual results. i am looking forward to getting started. but i have to go grocery shopping first. the only challenge i could face is doing without that daily cup of coffee. i will now have to get use to drinking water again. God bless everyone on this fast to reach a new spiritual level in God. Can you have the 100% tortilla chips baked? Are soups okay for the Daniel Fast? Are there any kinds on the market that would be acceptable? I assume the processed soups (even the meat-free ones) are not allowed. Would you consider Fish (salmon, mai mai) or chicken a meat? I purchased the cookbook last year in either late december or early January to do the Daniel Fast with my church, unfortunately it was on another computer which has since died on me. Any chances that you can find my order and allow another download. Your help would be greatly appreciated since my family is fasting again this year and I am about to shop and cook. I have a few recipes that you attached as PDF files to e-mails you sent last year as appendixes. Your help would be greatly appreciated. Need some ideals for cooking. Does the 2009 version of the cookbook contain recipes for the 21-day fast? Or is that only available in the first edition of the cookbook? i can’t buy the book now, but i want some recepies please. how do I download the recepies?